Have you ever experienced your 10yr old enjoying science experiments? Let Zee Learn Gakken Science Academy take your child on an exploration of science and its magic! Zee LearnÂ in association with Gakken J. Holdings, a leading educational firm from Japan, has launchedÂ 'Zee Learn Gakken Science Academy'Â for schools. 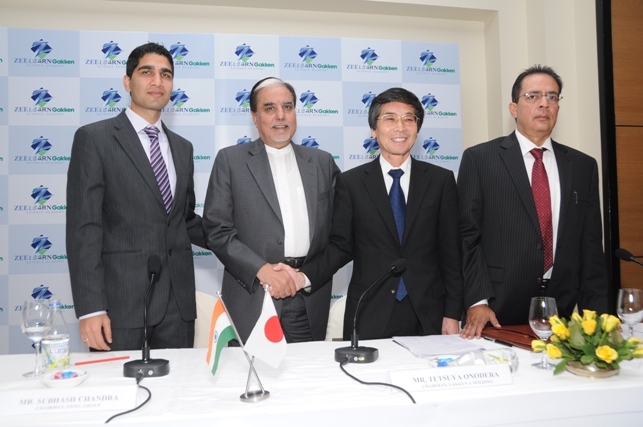 The partnership was sealed by Mr. Subhash Chandra, Chairman, Essel Group and Mr. Tetsuya Onodera, Chairman, Gakken J. Holdings.Â Â The academy can be incorporated in the schools from the current academic year itself. Speaking on the occasion,Â Mr. Subhash Chandra, Chairman Essel GroupÂ said, I have always believed in life, that unless and until one does not ask questions, the human brain does not develop. Zee Learn's association with Gakken J. Holdings will help children to ask questions, explore and reflect their actions, thereby aiding in the holistic development of a child. There would be 36 subjects and more than 100 experiments that would be conducted during the curriculum. Our objective is to take this novelty teaching to various schools so that maximum children are benefited by this academy. The course will be affordable and extremely simple for children to understand. This academy aims to improve conceptual understanding and develop scientific aptitude amongst students by providing hands on learning experiment tools. The program is a 3 step systematic methodology of 'OBSERVE, EXPLORE and REFLECT' which would help a child nurture his/her scientific aptitude. Mr. Tetsuya Onodera, Chairman, Gakken J. Holdings said, Zee Learn Gakken Science Academy has given us an opportunity to bring our expertise to the schools in India. We are thrilled to see the overwhelming response received from schools and students during demonstrations. I am confident that this program will definitely ensure a better conceptual understanding and help children develop an affinity towards the subject. This methodology enables students to design their own learning process. They lead the way by reflecting on their experiences which makes them the experts of their own learning process. When in classroom, the instructor helps create situations where the students feel safe questioning and reflecting on their learning. Besides building a scientific temper amongst students,Â Zee Learn Gakken Science AcademyÂ also aims to introduce and incorporate best practices in education. In order to execute the same, the science program would be conducted in the school premises by dedicated personnel trained by the company. Commenting on the occasion,Â Mr. Sumeet Mehta, CEO, Zee LearnÂ said, We are extremely excited to bring in this innovative learning method to India in association with Gakken J. Holdings. Our aim is to bring the best in class education standards across all schools / education institutions in India and help build superior quality of human capital for the future. We aim to build and create innovative learning environments that facilitate holistic development. Being in this sector for more than a decade, we felt the need to revolutionize the way our children were learning. In our search for the right partner who will help bring about this change we found Gakken to be an ideal match, he added. The Indian education system is transforming at a rapid pace. Children today have access to a wide world of knowledge and information through internet and broadcast. The model needs to be in line with the increasing aptitude of this set of next gen students. With an experience and expertise of over a decade in the education industryÂ Zee Learnhas now extended its services to other schools in India through Zee Learn School innovations.Â Zee Learn School InnovationsÂ has a vast gamut of offerings ranging from science to robotics to language lab solutions.Â Zee Learn Gakken Science AcademyÂ is a part of this umbrella.